Google works in mysterious ways. When the search engine isn't trialing an algorithm to spider Twitter updates or finishing work on its latest communication tool, it's a well-known fact the company is testing new features to add to its listings pages. Generally, these minor tweaks are experimental – small changes designed to observe user-behaviour. Most of the time they go unnoticed by the general public and eventually they slip away after a short period. 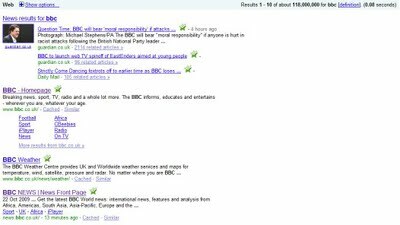 Indeed, the recent UK SERPs alteration is a perfect example; a controversy which rocked the SEO community, but barely made a ripple in the outside world. For those of us who spend their day monitoring Google SERPs, these changes stand out like a position one ranking. They will cause speculation, debate and the occasional-heated argument as SEO professionals across the world discuss the company's actions and try to second-guess the implications of a relatively minor change. 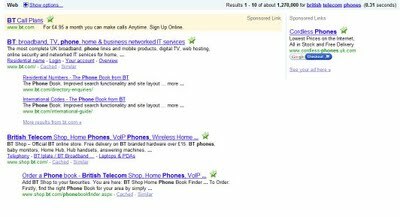 This search not only lists the main site for British Telecom, but also the url for directory enquiries and international dialing codes. These indented listings only appear when users do a search query for a brand name combined with a keyword – for instance, 'British Telecom phones' or 'Manchester United kits'. It makes sense for Google to implement this feature for specific keyword searches. It stands to reason a user searching for a brand is likely to want a product or service for a specific company. 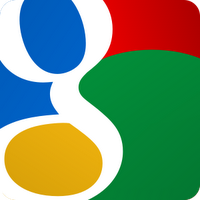 Indeed, many of the tweaks Google makes are designed to give browsers access to the information they may need faster. Sergey Brin, the co-founder of the company, said Google was the only website which aimed to make the user move on to another website as quickly as possible. Perhaps this indented listing feature is just another way Google hopes to second guess its users.